A-HOTEL.com - Luxury and cheap accommodation in Ban Nong Hoi, Thailand. Prices and hotel, apartment booking in Ban Nong Hoi and surrounding. Located on a hill overlooking the hills of the Mae On Valley, Lanna Hill House is a 4-bedroom private villa with a pool. Blending both Lanna and colonial designs, this beautiful property is fully furnished along with teak, rattan and bamboo furniture. Situated in Mae On, Monkeaw provides a terrace and free WiFi. The rooms are equipped with a balcony. Providing free bikes and free WiFi, Malila Homestay offers accommodation in Ban On Luai. Some units feature a seating area and/or a terrace. Sippa Hotspring is set in Mae On and features free bikes and a garden. Featuring a restaurant, the property also has a terrace. Lakeview Resort provides air-conditioned rooms in Mae On. The property has a garden, as well as a terrace. Situated in Chiang Mai, within 26 km of Chiang Mai Night Bazaar and 27 km of Chiang Mai Bus Station, Roong Aroon Hot Spring Resort provides accommodation with an outdoor swimming pool and a garden, and free WiFi. The property is around 27 km from Tha Pae Gate and 28 km from Three Kings Monument. The Loft Hillside Montarnthong is located in Ban Pang Champi. Among the various facilities of this property are a garden and a terrace. Featuring air-conditioned accommodation with a terrace, Yuan House is located in Chiang Mai. This villa offers a garden as well as a shared lounge. Boasting a garden and terrace, as well as a restaurant, สวนฉัน Igarden is situated in Ban Pang Champi. All rooms feature a flat-screen TV with satellite channels and a private bathroom. Nestled amidst tropical gardens, Papai Country Lodge boasts an outdoor pool and a restaurant. Featuring comfortable villas, the property offers on-site parking and free Wi-Fi access. Located 13 km from MAIIAM Contemporary Art Museum, Baan Ping Kan Resort provides rooms with air conditioning in San Kamphaeng. With barbecue facilities, the property also has a shared lounge. Located in Ban Pok Nai, Baandin Tharnthong-Maekhumpong provides free WiFi. Among the various facilities of this property are a terrace and a shared lounge. Baan Suan Him On in Ban On Luai features a garden and a terrace. All rooms boast a kitchenette and a private bathroom. Featuring an outdoor swimming pool, Mala Dhara is set in Chiang Mai, 22 km from Chiang Mai Bus Station. Built in 2016, the property is within 25 km of Chiang Mai Night Bazaar. With a garden and a terrace, Maekampong Huean Bog Hug offers accommodation with free WiFi. A balcony with mountain views is offered in every unit. Situated in Ban Huai Kaeo, Doilia Homestay offers a garden. Among the various facilities of this property are a terrace and a shared lounge. Boasting free bikes and free WiFi, Papa's Garden is situated in Doi Saket. Among the facilities of this property are a restaurant, shops and fitness centre. 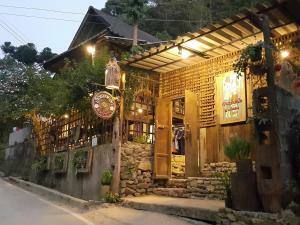 Baanpong Lodge is only a5-minute drive from Muang On Cave. It features an outdoor pool and an on-site restaurant. Located in the beautiful Doi Saket of Chiang Mai, Baan Chai Thung Resort offers spacious villas with free Wi-Fi in the middle of peaceful surroundings. Guests can take a dip in an outdoor swimming pool or relax with massage services. ChangKaew Resort ChiangMai offers accommodation with free WiFi, a restaurant and a children's playground. Free private parking is available on site.